How many times has this happened to you? You spend an entire day bombarded by sounds: Children crying incessantly. The monotonous banter of coworkers. The nonstop ringing, beeping and vibrating of your smartphone. Cars and trucks endlessly droning past your window. But be careful what you wish for. Because silence – the absolute silence we often profess to want – can make you crazy. And not just the casual “yeah, whatever” crazy, but the “get-me-out-of-this-place-now!” crazy. If you really want to experience absolute silence, come with me to one of the quietest places on earth. You’ll find it inside a test laboratory called an anechoic chamber, and we have one here at Jabra. It’s where we test the performance of our audio devices and where our sister company, GN ReSound, evaluates its hearing aids. Anechoic chambers are weirdly futuristic-looking labs, packed with odd-looking cones and wedge-shaped materials plastered to the walls. These materials absorb sound rather than reflect it, enabling absolutely no background noise to be picked up by the human ear. The average sound level inside some labs can reach a quieter-than-quiet minus-20 decibels. For perspective, the sound of our breathing is about 10 decibels, the typical conversation is around 60 and the subway is a comparatively ear-splitting 90. Even libraries register about 30 decibels. The experience is eerie, bordering on maddening. You quickly begin hearing things that aren’t there. That’s because your brain, deprived of external noise, begins to fill in the blankness with something, anything. Close your eyes and the additional lack of stimuli makes the experience even more frightening. Panic and nausea rapidly set in and you want out – now. In fact, very few people can last for more than a few minutes alone inside an anechoic chamber. And it’s why we only allow skilled engineers and lab technicians to work in there. I know. There’s a certain irony to today’s blog. Here I am, a guy whose job is to transform people’s lives through the power of sounds, and instead I’m talking about what life is like in an environment without sound. Perhaps a little background noise or soundtrack to our lives isn’t such a bad thing after all. Two of my favorite soundtracks to quiet moments are Bjork’s Oh it’s So Quiet and Depeche Mode’s Enjoy the Silence. 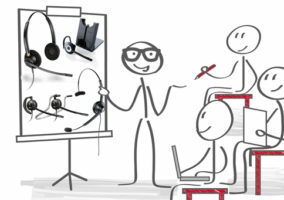 How Do I… Improve Sound Quality in the Contact Centre?